Types of Rocks: Earth’s crust is made up of various types of rocks. Any natural mass of mineral matter that makes up the earth’s crust is called a rock. Rocks can be of different colour, size and texture. 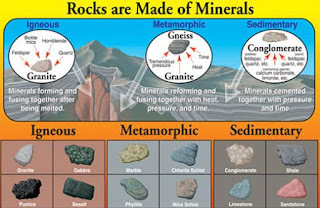 There are three major types of rocks: igneous rocks, sedimentary rocks and metamorphic rocks. Igneous Rocks: When the molten magma cools, it becomes solid. Rocks thus formed are called igneous rocks. They are also called primary rocks. There are two types of igneous rocks: intrusive rocks and extrusive rocks. Intrusive Rocks: When molten lava comes on the earth’s surface, it rapidly cools down and becomes solid. Rocks formed in such a way on the crust are called extrusive igneous rocks. They have a very fine grained structure. For example, basalt. The Deccan plateau is made up of basalt. Extrusive Rocks: Sometimes the molten magma cools down deep inside the earth’s crust. Solid rocks so formed are called intrusive igneous rocks. Since they cool down slowly they form large grains. Granite is an example of such a rock. Sedimentary Rocks: Rocks roll down, crack, and hit each other and are broken down into small fragments. These smaller particles are called sediments. These sediments are transported and deposited by wind, water, etc. These loose sediments are compressed and hardened to form layers of rocks. These types of rocks are called sedimentary rocks. For example, sandstone is made from grains of sand. Metamorphic rocks: Igneous and sedimentary rocks can change into metamorphic rocks under great heat and pressure. For example, clay changes into slate and limestone into marble.